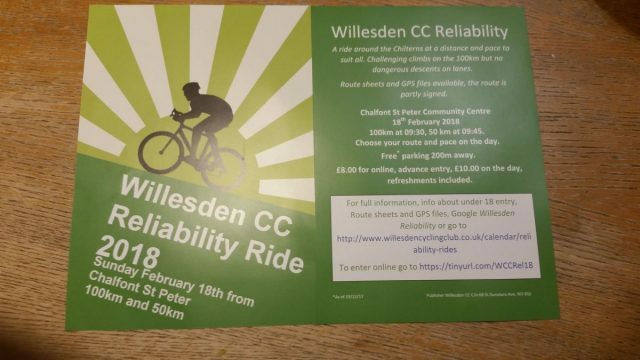 I need some help, please, for the Willesden Reliability Rides which are being held on Sunday, 18th February. Catering is taken care of by Vyv and her team. I want the routes checked any time between now and the weekend beforehand. On the Friday or Saturday route signage put up. This has to happen close to the event as it tends to get taken down by nimbys. On the day, help at the start. You can be taking part in the event, it will just mean turning up by 0830 to help sign on etc. If you are not taking part I would be pleased to get some help with arrivals, depending on field size. An event photographer to get some pictures for here and WCC website and as publicity for next year. It will involve being at the start and somewhere photogenic out on route. Reasonable out of pocket expenses will be met and you will have my and the club’s gratitude as a reward. I can help in any capacity. Happy to help checking routes or putting signs up. I can’t help on 18th. I’m sorry for the delay in reply – I do not get an email notification which is why I gave my email address so I only spotted this just now. I think I am covered for everything in advance of the day, but thank you for your kind offer. Depending on hangover intensity I may ride one or both of the routes this weekend. What sort of stuff do you want noted for a route check? Taking part in the 100km, but will try and get there for 9 to give a hand. Thanks Ian I will try and get there by that time (or hopefully by 9 at the latest!). Is there a way of signing up for the 100km event without going through Paypal?